Santorini Island dream destination, the most famous island of Greece. Long desirable destination in the Mediterranean Sea. We arrived on the island by plane for an hour. After our check-in at the Drossos Hotel in Perissa around noon we had a panoramic bus tour. The first stop was the capital Thera. The largest city on beautiful Santorini in Aegean sea, literally built on the caldera of the volcano. I must tell you that all hotels and dwellings are in one style. The first floor is rectangular, necessarily with arches on the porch, and the second floor, which is necessarily the last one, is something between an attic room or a maisonette connected to the first floor with an internal or external ladder. Anyone who wants to have property on the island must comply with this style, but he does not get a building permit. The colors of the buildings are in white, blue and rare in light beige. Let's go back to our walk in Thera. The streets are too narrow to get away with another tourist. There is a panoramic street where all visitors walk and naturally shoot. Even off-season here is overcrowded by wanting to see this magical place. The large number of small churches makes an impression - about 270. Honestly, apart from perfectly fitting into the landscape, they have no other purpose. What is the meaning of these churches, all of which are closed with three lockings. Another thing that made me feel is the lack of drinking water. 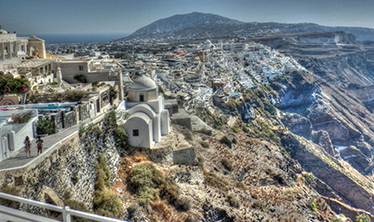 In fact, the island of Santorini has only one freshwater spring, from which aquifers spread water through the hotels. Even that water seemed to me to be a salty taste. Some green mobile moguls passed through the street to get to the hotel that had run out of the water. The food in the horsetail is terribly expensive for us (a portion of seafood and garnish is over 20 euros). If you continue north on the panoramic street without even finding out you enter the neighboring town of Emerovigli. It is a traditional Cycladic settlement that shows the entire west coast of the island. A narrow, steep path can be reached in about 20 minutes to the Skaros rock. Before the last eruption of the volcano there was a fortress from which there is no trace at all. The last stop for the first day of Santorini is the city of Pirgos. It is the highest settlement on the top of which there are remnants of a Venetian fortress. We visited a tavern in the evening with delicious Mediterranean food. I tried fillet of swordfish and Greek moussaka with Santorini salad. I forgot to mention the neighboring islands of Santorini. The nearest Anafi Island is only a few kilometers away and can be reached by boat or motorboat. To the north of Santorini is Ios Island, which we saw from the ferry on the way to the capital Athens. Santorini beauty can be compared only to the attractions in Mykonos, which we reported in detail in our previous article. The closest are the volcanic islands of the same island group of Santorini, namely Thirasia, Palea Kameni and Nea Kameni volcano.